Let me take you back maybe 2 years ago. Sam’s friend Whitney brought a bag of frozen Vanessa’s dumplings out to the beach- and they were delectable. So I went to the Vanessa’s in Chinatown and bought a bag myself. And lord I tell you, I could not figure out how to make them. I tried to fry them and I remember completely burning the outside- and the middle was raw. Which just goes to show- that even if you have no idea how to cook- or feel like you have no instinct on the matter– it can be learned– and if you have the patience and the willingness to do so- you can figure a lot out on your own. Dumplings are one of those why should I bother making when i get buy them 6 for a dollar- and they will prob taste better anyway. Well, I dunno. I just felt like making something tedious. And sometimes dumplings can give me this mystery meat feeling- so I like knowing what’s in them? And they freeze super well, so just think how happy i will be– coming home late one night and remembering that homemade dumplings are just minutes away. I have to say- I was surprised how good these tasted- and how much like the dumplings I would buy. My only complaint was the wrappers- were kinda thin and skimpy. Next time I will either make my own- or try a different brand. Served dumplings w. bok choy in a miso butter– also made escarole w. miso butter this week- delicious. This recipes comes from a blog called The Steamy Kitchen. I sort of internet meandered to it- finding that several people referenced an original recipe from Asian Dumplings by Andrea Nguyen. Steamy Kitchen says she “adapted” from Andrea’s and I would highly recommend looking up her post for Chinese Boiled Pork Dumplings- because she has great pictures of the folding/wrapping process. She says it makes 50 dumplings. But mine only made 28. Steamy K. also advices “Salting and squeezing the water out of the cabbage is essential. 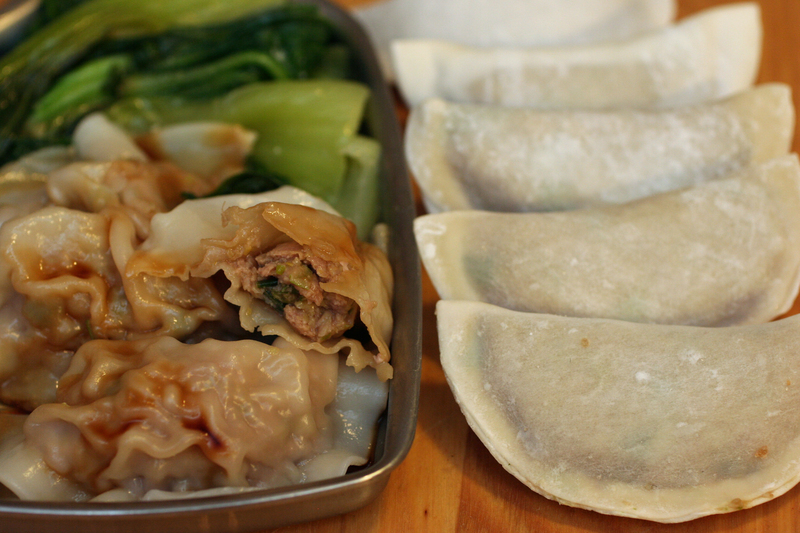 It prevents your dumplings from being too soggy!” FYI– ( ) is Steamy K. notes. Mine, as always, are [ ]. Thank you steamy k.
1. For filling, put cabbage in food processor and process until finely chopped. Remove cabbage to large bowl and sprinkle w. salt. Let sit for 10 mins. In meantime, return to food processor– add ginger, chives, pork, pepper, soy sauce, rice wine and sesame oil. Pulse a few times to just mix- set aside. 2. Using your hands– a cheesecloth or clean paper towel- grab a handful of cabbage and squeeze to get out excess moisture. You want it to be dry. Put cabbage back in large bowl- fold in pork mixture. 3. [Line a baking sheet w. parchment or wax paper.] mix cornstarch and water in small bowl to make slurry [the glue]. Take one dumpling wrapper- spoon a scant tablespoon [tho I found a rounded teaspoon fit better] of the pork mixture into the middle of the wrapper. Dip a finger in the slurry– and trace it around the edges of the wrapper. Bring the bottom side of the wrapper, up to meet the top- to form a half moon shape. Pinch in the middle of the top– then around the edges– so there is no air bubbles and sealed all the way around, encasing the filling. [reminder that i recommend looking at Steamy K for picture. and this is definitely something the first one you will break- but then you get a the hang of it. kinda like rolling a… well, anything really]. Placing finished on baking sheet. covering w. a barely damp paper towel. Best to cover the wrapper pack w. a damp paper towel too so don’t dry out. Finish rest of dumplings- and put on baking sheet, making sure not to touch. Next stop- I am going to try frying and will let you know how it goes. So ambitious of you to make dumplings when you have Vanessa’s close by! $8 for 4 meals worth of food last time i went–makes it hard to want to make my own, but i’m happy you gave it a go.